Developed by Frank A. Gerbode, MD, TIR is a regressive desensitization procedure for reducing or eliminating the negative residual impact of traumatic experience. As such it finds a major application in cases of post-traumatic stress disorder (PTSD). A one-on-one guided imagery process, TIR is also useful in remediation of specific unwanted stress responses, such as panic attacks, that occur without significant provocation. Thematic TIR traces such conditioned responses back through the history of their occurrence in a client’s life to the stressful incidents primarily responsible for their acquisition. The resolution of the primary incidents then reduces or eliminates the target stress response. As TIR draws heavily on these same well-established principals, Dr. Gerbode, who was originally schooled in psychoanalysis, and Dr. Robert H. Moore – a cognitive – behaviorist colleague, and author of these notes – routinely reference this intersection of the Freudian and Pavlovian constructs in presentations of TIR to the mental health professions. Whether favoring the remedial logic of “abreaction” or of “extinction,” dedicated trauma workers display a strong and growing philosophic and clinical consensus regarding the importance of addressing traumatic experience with a guided imagery procedure like that employed by TIR. Roth and Newman (1991) describe the ideal resolution process as one involving “a re-experiencing of the affect associated with the trauma in the context of painful memories” (p.281). Such a process, the authors point out, brings the individual “to both an emotional and cognitive understanding of the meaning of the trauma and the impact it has had…and would lead to a reduction in symptoms and to successful integration of the trauma experience” (p.281). Grossberg and Wilson (1968) have shown that repeated visualization of a fearful situation produces a significant drop in the physiological response [as measured by galvanic skin response (GSR) as a biofeedback measurement] to the threatening image. Some trauma therapists employ hypnosis as an accessing tool. Although this is not the case in TIR, it is interesting to note the similarity of the hypnotic and non-hypnotic approaches to resolution, once the client has contacted and begun to un-suppress a traumatic incident. MacHovec (1985) confirms that hypnotic regression can be used to help clients recall and revivify a traumatic incident, vent emotions, and gradually reintegrate the experience with improved coping skills. Many current therapies attempt primarily to relieve the client or patient of pent-up emotion, either in cathartic episodes or over longer periods of time in which emotional release takes place less dramatically. If we examine catharsis more closely, however, we can readily discover several cognitive events which have significant influence on the experience. If these cognitive events do not occur, no amount of “emotional expression” is likely to be helpful (p. 81). Successful clinical application of TIR requires an absolute minimum of three days of intensive training – which includes skill development exercises, live and videotaped demonstration sessions and both giving and receiving TIR sessions under the supervision of a trainer certified by Applied Metapsychology International – followed by an optional practicum [internship] with consultation/supervision. As of this writing, TIR training for mental health professionals and para-professionals is available in at least ten countries around the world. See the Global training calendar or correspond with the trainer nearest you. Astrup, C. (1965). Pavlovian psychiatry: a new synthesis Springfield, IL: Charles C. Thomas. Beck, A. T. (1970). “Role of fantasies in psychotherapy and psychopathology”. The Journal of Nervous and Mental Disease, 150, 3-17. Boudewyns, P. A., Hyer, L., Woods, M. G., Harrison, W. R., and McCranie, E. (1990). “PTSD among Vietnam veterans: An early look at treatment outcome using direct therapeutic exposure.”Journal of Traumatic Stress, 3, 359-368. Foa, E. B., and Olasov, B. (1989). “Treatment of post-traumatic stress disorder.” Workshop conducted at Advances in Theory and Treatment of Anxiety Disorders, Philadelphia, PA.
Folkins, C. H., Lawson, K. D., Opton, E. M. and Lazarus, R.S. (1968). “Desensitization and the experimental reduction of threat.” Journal of Abnormal Psychology, 73, 100-113. Gerbode, F.A. (1986). Indicators and end points. The Journal of Metapsychology, 1, 51-56. Gerbode, F.A. (2009). Beyond Psychology: an Introduction to Metapsychology, 4th Ed. Menlo Park, CA: IRM. Horowitz, M. (1986). Stress Response Syndromes (2nd ed.) Northvale, NJ: Jason Aronson. Manton, M., and Talbot, A. (1990). Crisis intervention after an armed hold-up: Guidelines for counsellors. Journal of Traumatic Stress, 3, 507-22. Moore, R.H. (1993). 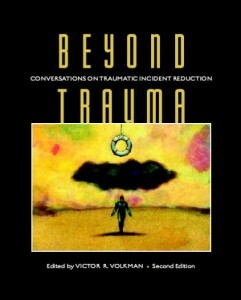 Traumatic incident reduction: a cognitive-emotive treatment of post-traumatic stress disorder. In W. Dryden and L. Hill (Eds.) Innovations in rational-emotive therapy. Newbury Park, CA: Sage. Warren, R., and Zgourides, G. D. (1991). Anxiety disorder: A rational-emotive perspective.. Elmsford, NY: Pergamon.